Family Tree Nursery, we carry everything for the perfect lawn and garden. We stock a large assortment of potting mixes, fertilizers, repellants, chemicals, lawn food, watering accessories, KState-tested grass seed, professional tools and bird products – with more organic options than ever! Your yard CAN be the envy of your neighbors – we can help! We have everything you need to grow the healthiest lawn on the block and can walk you through each step. We stock everything you’ll need from Gilmour tank sprayers to KState-tested grass seed. And we now stock more organic options than ever! We embarked on a new exciting venture recently to package our own line of Family Tree approved products. We worked with KState and other leaders in the horticulture field and along with our knowledge and experience, started the Family Tree Nursery Solutions Line. Professional potting mixes and fertilizers that we use in our own greenhouses, fertilizers, weed preventers and grub control for the lawn.  Our goal when creating FTN Solutions was to develop easy to use products that were extremely effective while being more environmentally conscious. Not only do we carry the highest quality products, but we truly want you to be successful, and will do whatever we can to help you feel confident with your purchase. And we always provide complimentary use of a spreader with any fertilizer or grass seed purchase. 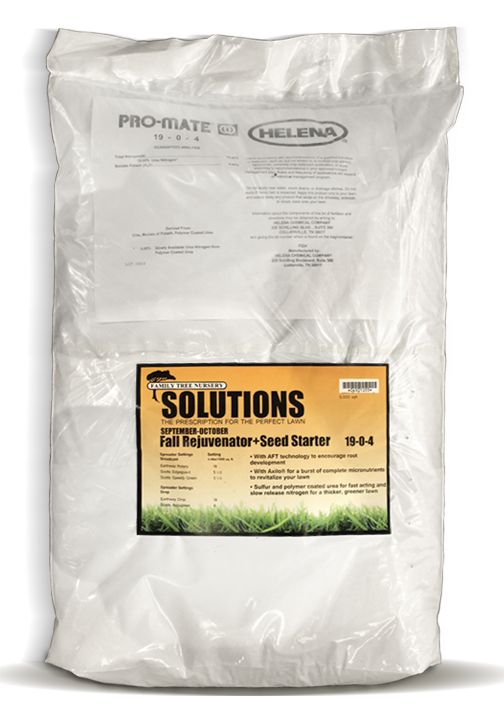 Apply our Solutions PreEmergent + Eco Friendly Lawn Food sometime between mid March to mid April prevent most summer weeds. Our organic, high iron fertilizer contained in this product will darken your lawn without encouraging excessive growth. Apply our Solutions Grub Control + Eco Friendly Lawn Food sometime between May to July to control insects at their peak. Our organic, high iron fertilizer contained in this product will darken your lawn without encouraging excessive growth. Weeds should be sprayed regularly for best results. TIP: WHY NOT APPLY A WEED AND FEED PRODUCT? The “feed” element in many weed & feed products push fast growth, causing you more mowing and stress to the lawn. Unless the conditions are perfect, much of the weed control will not adhere to the weeds, resulting in wasted and ineffective product.